Weddings are all about looking good and marriage is a symbol of love and bonding. So, if you can share your lives ahead, why not match your wedding outfits? and NO, IT DOES NOT LOOK TACKY, if you do it the right way. 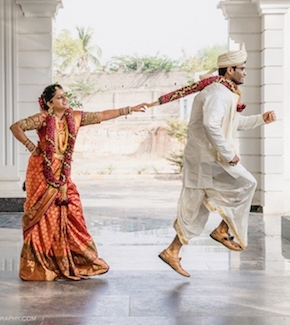 Matching wedding outfits can go wrong easily and so you need to make sure they are not overpoweringly matching colors. Instead, it should be of complimentary color schemes and palates. To help you out I have a bunch of pictures from a wide range of shades to suit your taste and aspirations. These ideas should give you a clear indication regarding your matching couple wedding outfits. Trust me, it looks elegant and everyone appreciates matching outfits if done RIGHT! If you pull this off, you’re going to be on cloud 9. This color is such that it leaves a magical impact. The blue is soothing, amazing and has a lot of hues to it which makes it easier to mix and match. Just as seen in the pictures, you can choose whichever shade- dark, royal or pastel blue that suits you. With dull and bright peaches paired together, the combination becomes absolutely stunning. It is a very neutral and summery color which goes amazingly well with all the gold and glittering bridal jewelry. The image shows a range of colors that look good with each other and come from the same peach palate with some faded peaches and some rich peaches with a pink undertone. On a very first thought, if someone thinks of putting red and pink together, a very unpleasant picture will develop in one’s head. Here is where the saturation of the colors come into play. It is very common to mess up this combo if the right tones are not picked up. A subtle vibrant but faded red (or coral) along with a light almost warm baby pink is the look to go for. 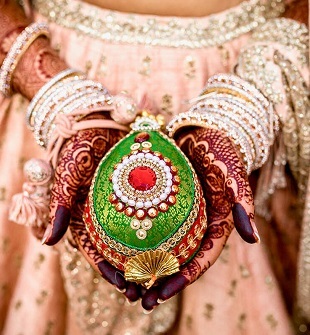 Just as illustrated by the couple lehengas and sherwanis below, this is a very festive wedding color put into justice. Recommended Read: Dear Delhi Brides, Shahpur Jat Has Got Your Back! Green is royal, green is glam and it’s different. With the different types of green like emerald, mint, peacock and so on, the couple is bound to look fabulous. By choosing the green and matching wedding outfits you are sure to inspire a lot of couples out there to try this very underestimated color out on their weddings. It is such a beautiful color and on finding a perfect match for it will enhance its beauty even more. So don’t be afraid to go big, go green. This combination that I particularly find interesting is inspired from the wedding shades. 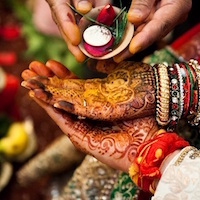 The elements in a typical Indian wedding like marigold flowers, Haldi, Mehendi, red powder, rose water and so on inspire such complementary colors. To add a bright and significant twist to your wedding outfits, do take inspiration from colors around you. Look at how beautiful the chosen color shade of orange on the bride and groom seems to be. It is paired with staple dark shades and mixed and matched in proportions in both the outfits. Go bold with this majestic and soothing shade of orange for your matching wedding outfit. Who said you only have to match colors? You can very easily match patterns as well. Just as this gorgeous matching outfit with floral print on it along with a great shade of mystifying cream. Just like florals, you can try any other pattern that you get inspired from. Don’t be afraid to try something new, it will definitely pay off. Those were some of the suggestions which I think could work brilliantly well together. Below are some more color palates to help you decide your fabric color in order to match the couple outfits. 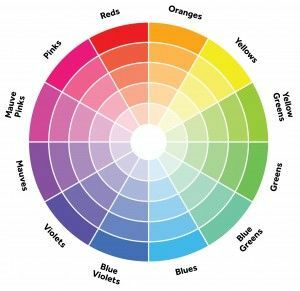 These include complimentary color palates as well as different saturations of shades that are out there. Another way you can match your outfits is by doing ombre style on your wedding outfits and get the pleasure of having multiple shades on your matching outfits. Mixing and matching outfits on you special day never go out of fashion. In fact, it is a brilliant idea to make you stand out and remember this once in a lifetime day forever with your loved ones.